At The Conservation Center, we have the privilege of learning about the personal histories and meanings of the pieces that are brought to us for treatment. Every collection is unique, and each piece that comes to us has a story to tell. 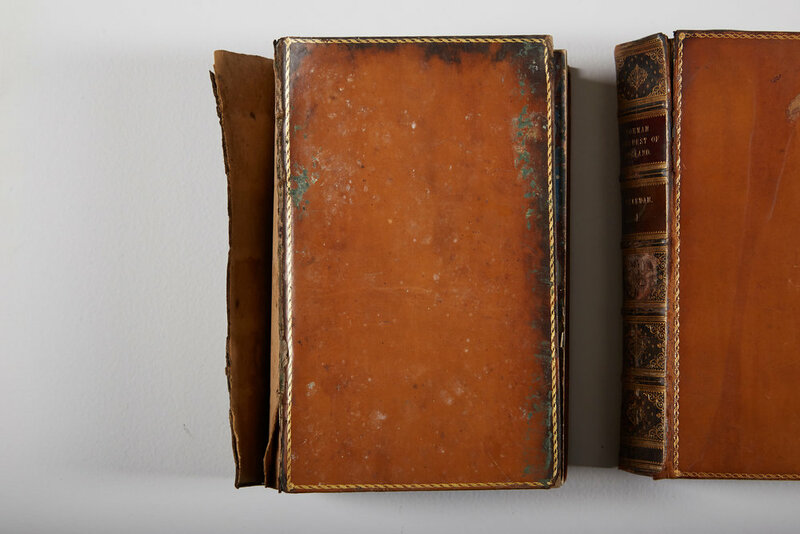 When we recently received a collection of rare books damaged in a violent storm and learned about their importance to our client, we were honored to assist with the conservation of the pieces and preservation of the history and meaning they held. Our client, an avid book collector, sought out a five-volume collection, Norman Conquest of England, after learning more about his ancestry through DNA testing. He found that he had Celtic, Scandinavian, and Viking origins. This spurred his deep interest in learning about the history of these cultures, and encouraged him to add to his book collection with rare, historical books on these subjects. Shortly after the set of books was purchased, there was a torrential rainstorm where our client lived. He had just moved from the East Coast to Indiana, and had stored his books in what he believed to be a safe, climate-controlled storage facility during the moving process. Ten days after the storm, the storage facility called with the difficult news that three feet of water had flooded the building and damaged his belongings. 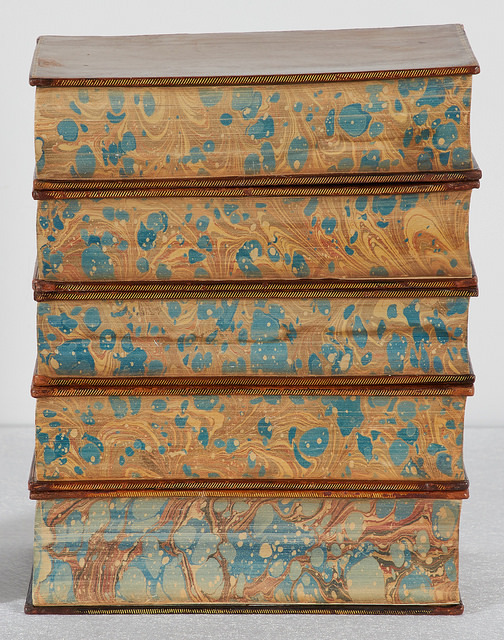 Upon examination of the volumes, our conservators noted that the covers of the books were either loosely attached to the textblock or cracking at the hinges, and that water stains were present on each of the volumes. Residual mold that had developed in the wet environment of the storage unit was visible on the text blocks and leather covers of the books, and the pages of each volume exhibited distortion. 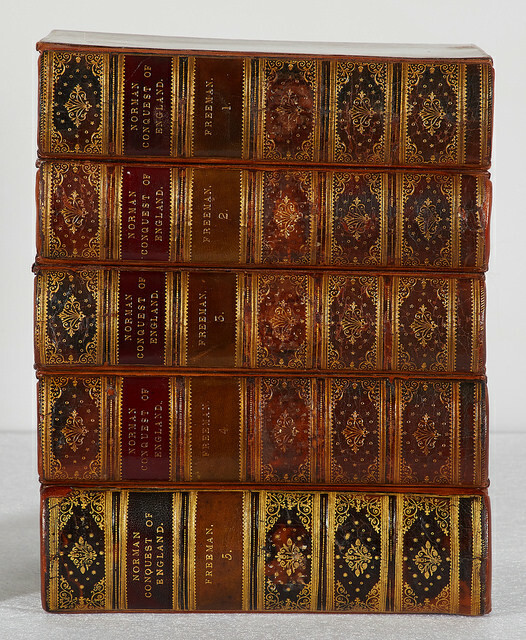 Volume 5 was in the worst condition of the set; its cover was completely detached from the textblock and was blackened from exposure to water. The leather of the spine was distorted due to moisture, and there was mold and a tide line on the textblock. Our conservators treated this set by re-backing the books while retaining all original pieces, including the marble end sheets. Next, the textblocks were reinforced with several linings and the marbled sheets were reattached. New leather spines were then created and attached to the original covers. Lastly, the textblocks and original spines were mounted to the new spines. The Center was also able to treat other works from our client's book collection, including volumes of works by Charles Dickens, and “The Federalist," Vol. 1 and 2.